The Yoga Direct six foot square yoga mat gives you tremendous freedom on the mat so you can transition from forward facing heart openers right into a wide legged forward bend without a second thought. 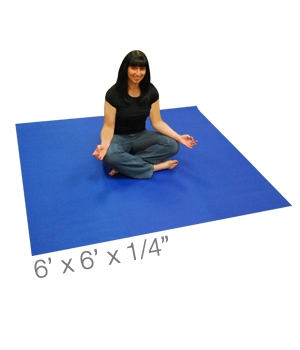 A square mat is also a winner for yoga teachers who often need to demonstrate a pose from more than one angle. Use this square mat for partner yoga, mommy and me yoga classes or outside where you don't want to spill over the edge of your yoga mat. With the changing movements of Pilates, this mat offers great space and traction. Highly recommend this mat. I didn't buy these for yoga (although I do yoga, and these would be great for that too!) I bought them to allow my older dog to get traction on our hard floors so he can stand and walk instead of slipping and falling. His vet suggested them and YogaDirect, and they have been perfect for him. The large size is wonderful at the base of the stairs and next to my bed, where he often got off rugs and then couldn't stand on his own. I love having the space on a double mat. It is thick and soft enough to be very comfortable. I'd buy it again.